» School zone again: Will council act? School zone again: Will council act? The Waverly Drive school zone in August, when the council was asked to remove the lower speed limit. 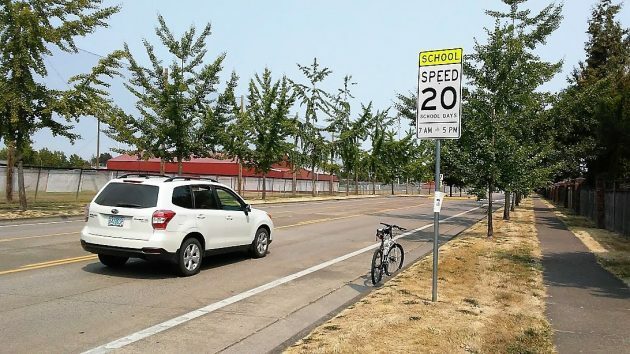 For the second time this year, the Albany City Council was asked Monday to do something about the 20 mph school zone on Waverly Drive east of the South Albany High School football field. The request came from Johnny Scot Van Ras, who’s retired from the Georgia Pacific pulp mill in Halsey and lives on S.E. 45th Avenue. He got a $165 ticket on Waverly for going 39 mph in what’s a 40 mph zone normally. His misfortune that this was at 9:30 on the morning of Oct. 11, a Thursday. Had it been the next morning, Van Ras could have gone 40 and nobody would have cared. Friday was a no-school day, whereas Thursday was not. In August, Diane Conrad , a resident of the nearby Mennonite Village, asked the council to get rid of the school zone on that section of Waverly because it’s unnecessary. The street is a block away from the high school, is separated from the athletic field by a cyclone fence, has good visibility and two crosswalks marked with flashing lights, and gets almost no foot traffic other than people walking their dogs on the sidewalks. A month, later the council turned down her request. On Monday Van Ras told the council about his ticket and denounced what he called a speed trap. Councilman Rich Kellum said Albany doesn’t run speed traps. But Van Ras disagreed. His court date on the ticket is this Wednesday. He’ll argue that the speed zone is improper because it has no sign showing where it ends. School zones are supposed to have signs where they start and where they end, but not all in Albany do. He suggested that at least, the Waverly signs should be upgraded with lights that flash to alert drivers when the school zone is in effect. Now, it’s in effect from 7 to 5 “on school days.” But unless it’s announced on reader boards, how are drivers without kids in school supposed to know what are school days and what days aren’t? Last month, Albany schools took days off on one Thursday and three Fridays: Oct. 12, 19, 25, and 26. This month there’s no school on Nov. 12, 22 and 23. Will anything come of the man’s request for the council to reconsider that school zone? The council didn’t ask the essential question the last time and there’s no sign it will consider it now. The essential question is: What makes that zone necessary when no school children are — or are likely to be — on, in or near the street? He has a point. The end of the school zone is not marked in that area so you don’t really know when you can speed up. Assuming there is some standard that dictates a “beginning” and an “end” sign is needed, he could win that fight. I agree this is not necessary! Streets where elementary schools are located don’t have these restrictions do they? I was on Waverly & Geary today, and the signs say ‘when children are present.’ This has nothing to do with being in a hurry, it is common sense! In FY 2018-2019 CARA will skim over $1,000,000 from the city’s general fund. The City Council has the power to under levy CARA a few thousand bucks and re-direct that money towards buying school zone signs with flashing beacons (and a radar sign, if desired). It’s about priorities. And it appears Albany city government still does not have the ability to distinguish “essential” from “non-essential” spending. With the Council’s stubborn approach on things like the parking at the post office, why would you expect them to approach this issue any differently? A flashing light when kids are going to school and leaving. The lights are also a reminder, especially for us that do not have kids in school. The sign then can read 20mph when lights are flashing. I make the end of the school zone at the 40mph sign on Waverly. The Waverly school zone is completely unnecessary in any kind of public safety sense. And the “on school days” wording does indeed imply the absurd assumption that the general public can keep track of which weekdays, and there are more than a few, on which school is not in session. The 40mph sign indicates the end of the school zone on Waverly. Too many options are available and cause confusion! If they are going to use language such as “school days”, or “when children are present” they should have to make sure all know what those days are, otherwise I encourage all to challenge any tickets received. Especially since kids are out so many odd days anymore. Curious how his court date went. Here’s the update: Johnny Scot Van Ras pleaded not guilty in Municipal Court, and the court set a trial date for 11:15 a.m. on Jan. 28, 2019. In the meantime, he has asked the city police for information, including the number of speeding tickets issued in that Waverly school zone, but has been informed he’d have to file a public-records request to get it.